If you need to make a change to the spelling of a name, your contact information, or your child's notes and allergies, there are two options available to you. You may be able to log into your Kinderlime account and make the changes yourself. Click on the menu icon in the upper left. Click on the name of your child (or one of your children). If you are editing your own information, you can click on any child; the information will be fixed for all of them simultaneously. Edit the information you need to change. You should see a keyboard appear when clicking on a field. Click on your own name or another authorized pickup's name in order to make a change to their name or contact information. 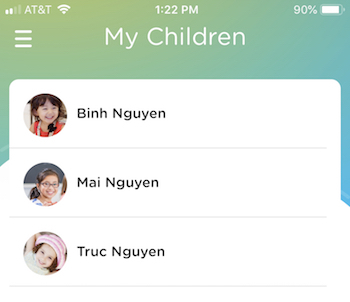 You can also add or remove individuals from your child's authorized pickup list. Click on "Family List" in the lefthand menu. 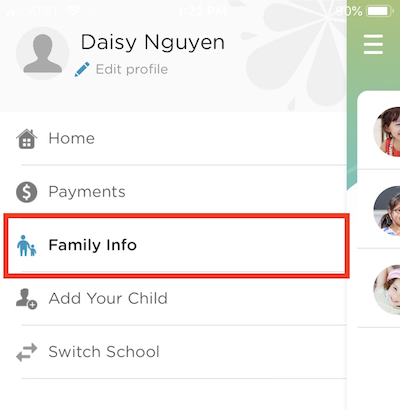 You will be able to add, edit, or remove parent or authorized pickup information. You will not be able to make any changes to your child's profile from the website. If you are unable to click on anything in the profile to make any changes, that means your school has turned off the ability for parents to edit information themselves. You will need to contact the school directly with the details of your request.